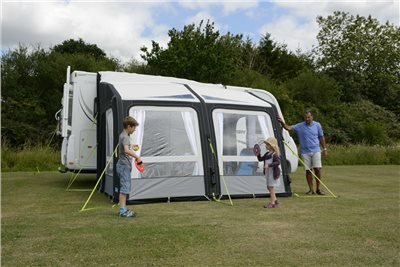 The incredibly popular Motor Rally AIR Pro has been updated for 2019 with new features including our DualPitch Roof System providing more interior headroom, making the awning more spacious and usable. A large secondary mesh panel can be found behind the righthand side window for additional ventilation in hot weather. Zip-in front mesh panels are also available as optional equipment for added ventilation. The Motor Rally AIR Pro uses our fantastic Weathershield™ Pro material for excellent waterproofing and long life but is still light enough for easy set-up and handling. The front panels can be rolled to the side or alternatively used ‘veranda’ style.